Local illustration and design group, They Did This! are one of the few comic creators in the country and with the odds stacked against them, these guys have managed to garner a bit of attention in our small pond. The Lil’ Five is a play on Africa’s Big Five and is an ongoing title featuring Leo Proudmane, Kitty Goodspot, Rocko ‘Rox’ Longhorn, Hoofer T. Hornboggle and Ellie Pureheart. These five youngsters get involved in various adventures in Proudclaw Valley and beyond. In ‘The Secret of the Black Cave’ the gang stumble across an old treasure map that eventually leads them on another whirlwind excursion. In the process they cross paths with the dangerous criminal Pandarin. A crime boss that has his sights on the treasure as well and ‘The Lil Five’, have to keep their wits about them so as to avoid capture. This title is geared mainly for readers from about 8 to 12 years old and might be a decent read for younger family members or school kids as a sort of gateway read into comics. Nevertheless, we have to scrutinize our local work even more than material from abroad in order to help the industry grow and improve. Obviously, experience and capital plays a large part in developing good comics but decent stories and art can be weaved even when these boosters are unavailable. Where ‘The Lil’ Five’ stumbles perhaps is in the story; it’s too intricate for what should be a simple narrative. 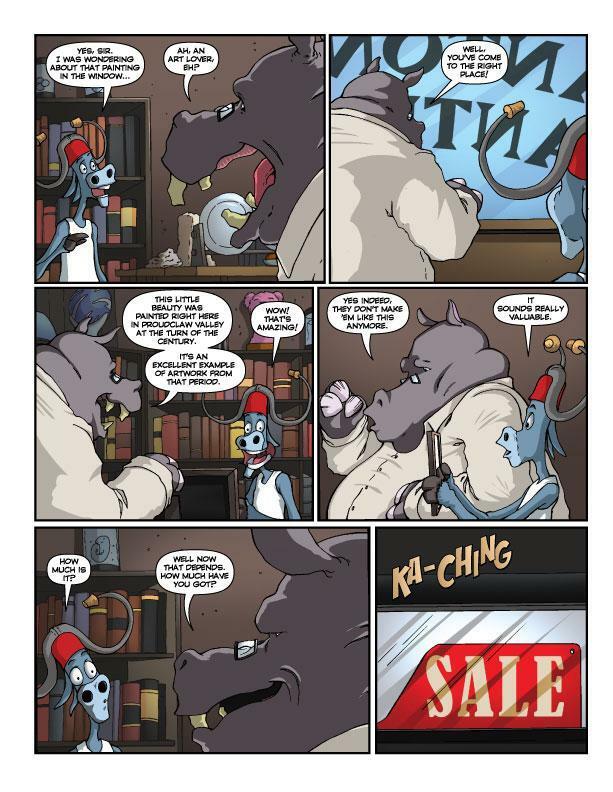 It starts with Hoofer hunting down a birthday present for his mom but he ends up in an antique store. After finding the treasure map they end up in a university professor’s office who explains the history of the map, all way too laborious for young kids to identify with or enjoy. Dense plot lines in kiddy comics work in stories like Asterix and Obelix or Tintin, where the action and humour are raised to a pitch and supplemented by captivating artwork that bewilders young readers who cannot grasp the subtelties of a complex tale. Those nuanced stories also have a simple underlying core that draws in young and old readers. With Asterix and Obelix that magnet is found in two funny heroes that bash Roman skulls. It’s obviously not fair to compare ‘The Lil’ Five’ to ‘Asterix and Obelix’ but the narrative devices in these popular reads have to be present in any kids’ book. The humour, vicarious allure of the characters and angle of the story is not strong enough to tell a simple or even more complex tale, making the whole plot seem forced and uneasy. Art wise, the colour is good despite the synthetic look. The pencil work fluctuates a bit, in many panels the characters and backdrops lack form and detail and because this book has a realistic quality it needs panels that are slightly more detailed. Even with these problems this book has an endearing quality but it just needs more refinement, something which will hopefully come with time and experience.